Rangatahi warming up for the 5km Run. Sunday, May the 22nd, saw the annual running of Panmures, 'King of the Mountain', event. The race includes a Kids marathon, half marathon with both a 5 and 11km walk/run option. Also on offer is the famous 'Over the Mountain wheelbarrow race'. 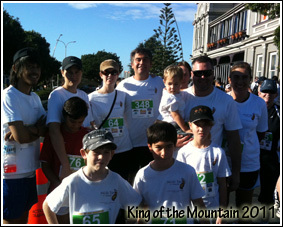 This year saw Ngai Tai enter a team of 25 into the 5km and 11km walk and run. The weather on the day was beautiful with plenty of sun and no wind whatsoever. As usual we all met by the 'Giant Ngai Tai flag' which is becoming a common sight at these type of events. Getting ready for the 11km Walk/Run. Our rangatahi decided to do the 5km run as they wanted to go over Maungarei. Most of the rangatahi said they would like to do both the 5km run then the mini-marathon next year !! !....Just goes to show how much energy these young ones have !!! AWESOME!! The only time I saw the kids was at the start. They flew off leaving us pram pushers in their dust. 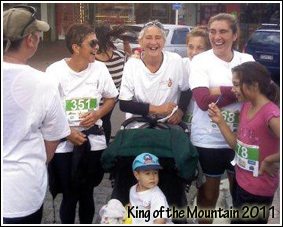 To all those that pushed a pram over the maunga...AWESOME!! 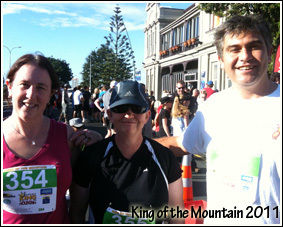 The 11km run was as gruelling as ever, with the run up the maunga taking it out of you in the first 4 kms. There were some very tired bodies after the race. 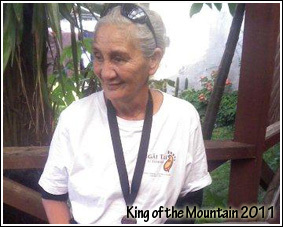 Of special mention is Whaea Lee who took out the 11km womens walk with Whaea Iris. Most of the participants unwound in the time old tradition of a nice 'BIG lunch' together. Yet again the whanaungatanga and spirit that these events foster within our Iwi never ceases to amaze me. The event was very well run, "well done Panmure Business Association", and we all look forward to participating with an even bigger team next year.Thank you as always to everyone who participated and those who helped organise this event. 2011 has taken off, with Ngai Tai entering a team in 3 major running events already. We still have half a year to go.....so stay tuned everybody.